Driving a sustainable business is becoming one of the top priorities. These past few years we have seen companies like Barco, Proximus, Colruyt Group, JBC, TUI, Nestlé, Unilever & Philips step-up their efforts. 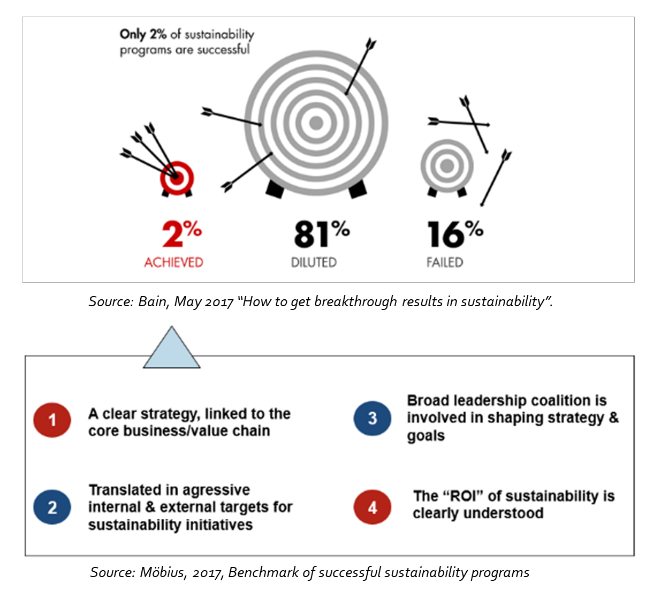 However, few organizations succeed in getting business value out of their sustainability program (only 2% of programs meet or exceed expectations, Source: Bain, 2017, “How to get breakthrough sustainability programs?”). Sinek states that every business knows what it does and how it does it, but most don’t understand or articulate why they do it. WHY is not about making money, that is a result. WHY is a purpose, cause, a belief It is the very reason your organization exists. As it is the case for each successful change initiative, you should clarify WHY you wish to set-up and implement a sustainability program. Organizations, and especially sustainability managers, already know it’s important to link sustainability to the business strategy, the strategic position, or even key strategic initiatives. This, however, is not enough. Sustainability leaders clearly find a sweet spot by linking sustainability (be it environmental or social stewardship) to WHY they exist as a company (their purpose, their mission) and WHY they will still exist in the coming years to be. Sustainability executives are not getting value out of sustainability programs because sustainability is commonly treated as a topic ‘next to the business’ – a must do. Whilst a sustainability program has all the need for a solid program management approach like any other business related and culturally dependent topic (e.g. innovation or operational excellence). A clear sustainability strategy: Focused on a limited number of highly material topics which are relevant to your stakeholders and can have an impact on the long-term success of your organization. Translating the sustainability strategy into key targets both on a strategic level and towards day-to-day operations (performance cascade), developed as stretch targets on the long-term. Communicate the key targets publicly as a commitment to the stakeholder community. Driven by senior leadership and middle management: translate the strategy and key targets into a roadmap, consisting of a limited number of breakthrough initiatives to build results and a myriad of smaller initiatives to build the cultural change. The purpose and return on investment of the sustainability program is identified and clearly understood within the organization. Additionally, it is highly relevant to build a strong network of well-suited partners around the identified sustainability issues/challenges/targets. Typical sustainability issues nowadays can include ‘closing the digital divide’ or ‘tackling the education gap’. Lots of these challenges require a systemic approach which cannot be handled by one player alone. It is important to focus on a limited number of topics which are relevant to both your stakeholder community and the success of your company (in line with the WHY of your company). Typically, the sustainability issues to focus on are largely dependent upon the sector, environment and geographical location your organization operates in. Different sectors are struggling with totally different sustainability topics. The good thing about sustainability is that company information, performance benchmarks and other reports are widely available. McKinsey Global Sustainability Benchmark, Sustainability accounting standards board, Carbon disclosure project… all publish very relevant, yearly updated material on “material topics” for various organizations in different sectors. A sustainability program should be driven by the focus on business critical issues and the ability to change on the fly when new information comes available. GDPR popped up in top 3 sustainability issues for a myriad of organizations out of nowhere. The key here is to link sustainability issues to the strategic agenda of senior management, to think about sustainability in terms of horizons (what should I focus on the coming year, the coming 5 years and the coming 10 years) and to allocate resources across topics. An organization thrives by the welfare of 2 crucially important stakeholder groups: the customers that believe you and the employees that serve them. Getting into a (why not continuous instead of 2-yearly) dialogue with these groups keeps you at current of what slumbers. Putting customers and employees higher on the sustainability agenda helps to build customer and employee engagement and builds the relationship with the way the organization operates, instead of only relying on the product or service performance.